A Zentange Challenge - Minette Riordan, Ph.D. I have been writing a lot this week about marketing plans and using the color wheel as an analogy for creating a visual marketing plan that is fun and funtional. I have been having fun being creative and exploring this topic. Now it’s Friday and time to have fun being creative with art projects. I have been working on Zentangle® Challenge #177 from the I am The Diva weekly challenge all week. These challenges are always fun and often stretch me to try new things with my tangling. This week’s challenge was to play with the new pattern Truffle, created by a junior in high school and one of the youngest certified Zentangle teachers, Caroline Brody. Check out her blog Zenticed. Way cool! At first glance, this pattern seemed pretty simple and quite pretty. Here are the instructions for drawing it. My first attempt was a total disaster, I ended up tossing it. I tried again a few times and was happier with result that I shared in the image above. One of the things I love most about Zentangle® is also something that I teach my coaching clients – persistence matters but perfection doesn’t. I let go a perfection a long time ago and I am more focused on enjoying the artistic journey for its own sake. If I don’t like the outcome of a piece I am working on, I let it go and move on to the next piece. I also realized that while I am quite comfortable winging it with lots of things, tangling requires practice. I love taking out my journal and just drawing a particular tangle pattern over and over until I figure it out to my satisfaction. I am also comfortable trying out new tangles directly on a tile or other piece of art but after working with Truffle this week, I was reminded that sometimes it pays to practice first. Practice didn’t make it perfect, it just made it better and more fun. Zentangle® draws me in for a variety of reasons but maybe the most important is the reminder to slow down, take my time, and enjoy the process. If you would like to learn more about this meditative form of drawing that will bring out the creative spirit in you, check out my post here on What is Zentangle. Expressive Arts Therapy sounds right up my alley, Elly. It took me a long time to let go of that inner critic and not worry about what something looked like. 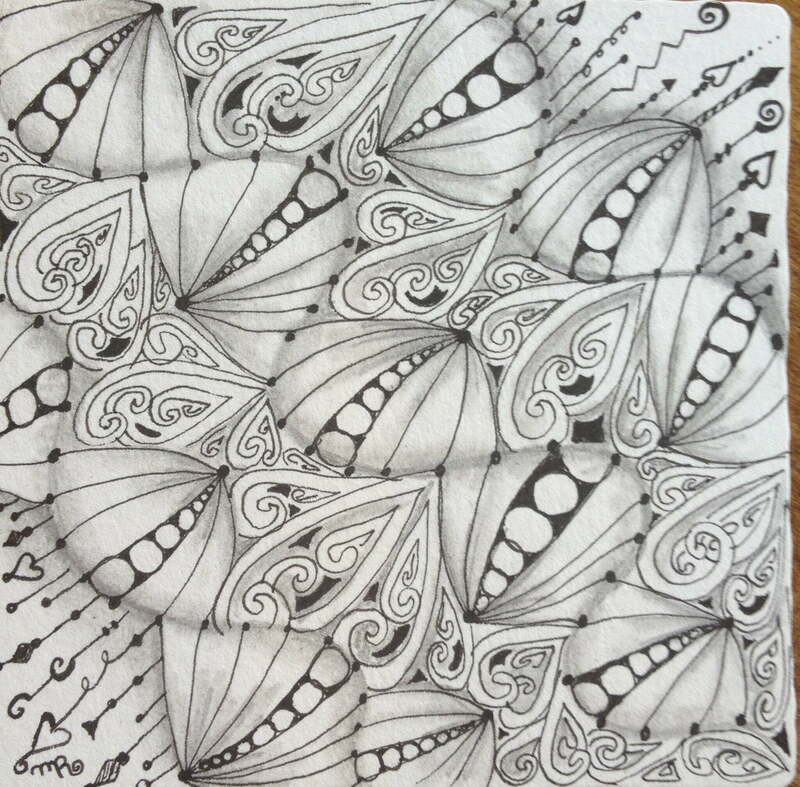 Zentangle was a perfect way to do that. Thanks, Vishal, it’s very freeing for the mind when we don’t have to focus on outcomes but just enjoy the creative journey. Like the roundness you created with your shading and lines. Adds a nice dimension to the tile. As an LCSW I meet people daily who are working on letting go of the critic. I have used the practice of tangling as one tool they can use to work on this. I am working at turning off the critic within. Thanks G.G., I will definitely check that book out, sounds great!! And glad you are working on turning off the inner critic. Very pretty! I like the mooka between the truffle and also your dangles. “persistence matters but perfection doesn’t”—YES! and the result shows the persistence. Like the the way the different tangles fit together…. Natural and organic…. Flowing and alive not tight. You are obviously enjoying the journey. I like how the Mooka hides behind the rolling Truffle hills! I love this tile, and how your shading makes Truffle look like soft quilted pillows! The Mooka is lovely too! Enjoy your time in Estes! I heard about Zentangle recently from a different blog. I know it’s not the same thing, but it brought back memories working with Spirograph when I was a teenager. It was so relaxing. Alana, I loved the Spirograph and it definitely gives me a similar feeling! I like your truffle very much. I really goes well with mooka. Lovely, this Truffle together with Mooka.